He won eight consecutive elections and spent more than 50 years in his Congress party before becoming the prime minister of India. A father of eight children, he spoke 10 languages, and was a proficient translator. He first travelled abroad when he was 53, mastered two computer languages and wrote computer code in his 60s. That's not all. 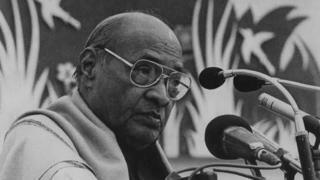 Before becoming 10th prime minister of a fractious democracy, PV Narasimha Rao campaigned in three languages, won from three states and was more connected to the grassroots than most modern-day Indian leaders. He also held a wide range of ministries - foreign, defence, home, education, health, law - with mixed results. Yet there was nothing flamboyant about Mr Rao. His biggest shortcoming, according to party colleague and former minister Jairam Ramesh was that he had the "charisma of a dead fish". Mr Rao was also the prime minister India forgot. To be fair, the unassuming politician was an accidental prime minister, emerging as a surprise candidate in a party numbed by the assassination of Rajiv Gandhi by a Tamil Tiger in May 1991, and the refusal of his bereaved widow Sonia Gandhi to take over the reins. Now a new biography by political scientist Vinay Sitapati persuasively argues that Mr Rao, who died in 2004, aged 83, was the principal architect of India's economic reforms. This, despite the fact that he ran a minority government - the two governments before him and the four after his regime were all minority governments and lasted barely a year each. His own avowedly socialist party was opposed to reforms. In other words, writes Sitapati, Mr Rao faced a "divided parliament, nervous industrialists, shrill intellectuals and a stodgy, statist Congress party". There is some truth in the contention that Mr Rao was simply in the right place at the right time. By June 1991, India was facing a near-existential crisis. Rajiv Gandhi had been murdered. The economy had tanked. The country had just enough foreign exchange to pay for two weeks of imports. Oil prices had trebled after the 1990 Gulf War, crippling an economy largely dependent on imported oil. Remittances from Indians working in the Middle East plummeted; and skittish Indians living abroad withdrew some $900m (£680m) from Indian banks. Two weeks after Mr Rao took power, India sent 21 tonnes of gold to the Bank of England so that India could get dollars to delay defaulting on outstanding loans. Three states - Punjab, Kashmir and Assam - were wracked by separatist violence. The Soviet Union, India's closest internationally ally, was imploding. And yet, despite these odds, the doughty Mr Rao pushed reforms like no other Indian leader - foreign investment limits were raised, the stifling licensing system dismantled, monopolies of state-owned companies removed, tariffs reduced, and capital markets and banking reforms were undertaken. He did this by handpicking a technocrat finance minister Manmohan Singh, who later became prime minister himself. He also chose a bunch of officers, who were liberalisers, and backed them to the hilt. He even had his spooks gather reports on Sonia Gandhi and senior party members on their position on economic reforms. To cut a long story short, the gamble paid off. By 1994, India's GDP was increasing by 6.7% a year - and would be more than 8% for his final two years. Profits for private companies increased by 84%. Foreign exchange reserves had swelled by more than 15 times. The first private radio stations and airlines began operations. "The India that Mr Rao had inherited was... second-rate. By 1994, this pessimism had given way to confidence that India could compete with the best in the world without losing her soul," writes Sitapati in Half Lion: How PV Narasimha Rao Transformed India, his meticulously researched, warts-and-all, biography of the leader. It was possibly the New York Times which first described the 72-year-old Mr Rao as India's Deng Xiaoping, "an ageing leader who, in his sunset years, has abandoned many, if not all, the economic precepts that had guided earlier governments challenging not only the old orthodoxies but an entrenched network of vested interests". Sitapati agrees, saying Mr Rao saw Deng as a philosophical mentor. He even tried, unsuccessfully, to meet Deng in China. In 1988, when he accompanied Rajiv Gandhi to China as foreign minister, he "was enormously hurt" when Gandhi decided to meet Deng without Mr Rao. Five years later, during a second visit to China as prime minister, he was again disappointed: the retired Chinese leader declined to meet Mr Rao. "The gossip was that Deng would have agreed to meet someone from the Nehru-Gandhi dynasty. Rao was not considered worthy enough." Sitapati writes that Rao's admiration for Deng's ability to wrap change in the garb of continuity was evident. "He was a pupil of Deng, praising the socialism of Nehru-Gandhis, all the while adroitly abandoning their policies." Like Deng, Mr Rao, a hardboiled socialist evolved into a pragmatist, and a canny practitioner of realpolitik. Mr Rao had his share of setbacks and none was more disastrous than the demolition of the Babri mosque by a mob of Hindu fanatics in November 1992. Sitapati says he was "blinded by his personal chemistry with a number of [Hindu nationalist] BJP leaders who assured him that no harm would be done" to the mosque. "Mr Rao's overconfidence in his ability to convince Hindu groups must go down as a serious failure of judgement." Why is Mr Rao forgotten today? For one, Sitapati says he was abandoned by his own party, which could not countenance the rise of a leader who did not belong to the Nehru-Gandhi dynasty. Also his stellar economic record was badly blotted by the demolition of the mosque which led to some of the bloodiest religious riots in post-independent India. Good economics often make for bad politics, and Mr Rao's party, ironically, lost the general election in 1996. Believing in reform by stealth, he did not campaign on the economy, and engineered an electoral alliance in the south of India which cost the Congress party dear. But, on the whole, says Sitapati, "Rao was ahead of his times." It is a sentiment echoed by many in India today.